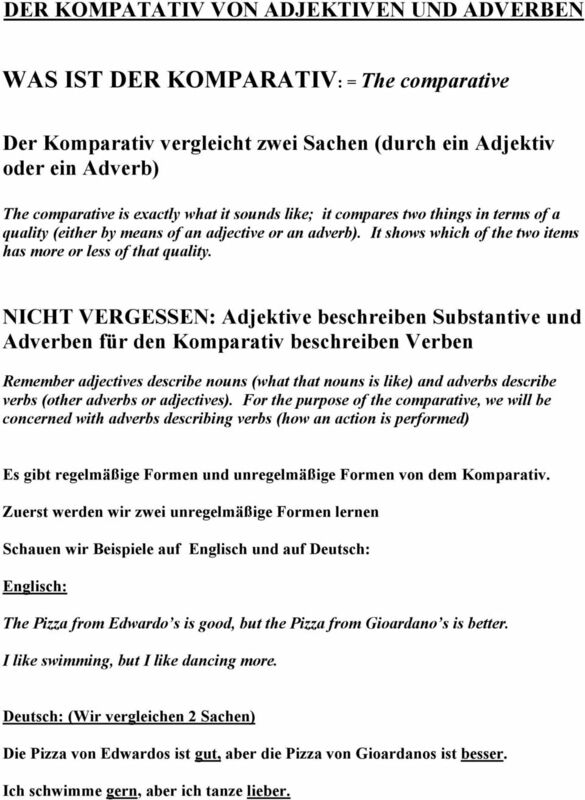 Download "WAS IST DER KOMPARATIV: = The comparative"
1 DER KOMPATATIV VON ADJEKTIVEN UND ADVERBEN WAS IST DER KOMPARATIV: = The comparative Der Komparativ vergleicht zwei Sachen (durch ein Adjektiv oder ein Adverb) The comparative is exactly what it sounds like; it compares two things in terms of a quality (either by means of an adjective or an adverb). It shows which of the two items has more or less of that quality. NICHT VERGESSEN: Adjektive beschreiben Substantive und Adverben für den Komparativ beschreiben Verben Remember adjectives describe nouns (what that nouns is like) and adverbs describe verbs (other adverbs or adjectives). For the purpose of the comparative, we will be concerned with adverbs describing verbs (how an action is performed) Es gibt regelmäßige Formen und unregelmäßige Formen von dem Komparativ. 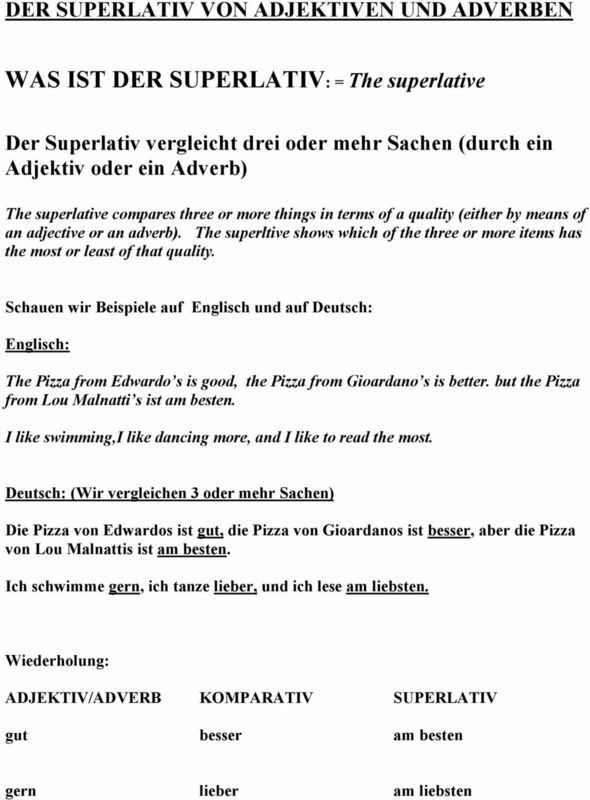 Zuerst werden wir zwei unregelmäßige Formen lernen Schauen wir Beispiele auf Englisch und auf Deutsch: Englisch: The Pizza from Edwardo s is good, but the Pizza from Gioardano s is better. I like swimming, but I like dancing more. Deutsch: (Wir vergleichen 2 Sachen) Die Pizza von Edwardos ist gut, aber die Pizza von Gioardanos ist besser. Ich schwimme gern, aber ich tanze lieber. 5 Wann benutz man so wie vs. als? 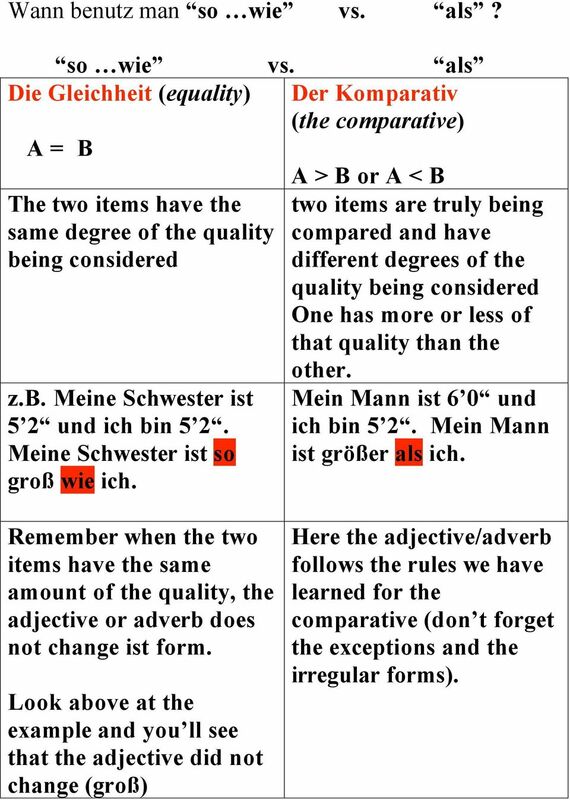 so wie vs. als Die Gleichheit (equality) Der Komparativ (the comparative) A = B A > B or A < B The two items have the two items are truly being same degree of the quality compared and have being considered different degrees of the quality being considered One has more or less of that quality than the z.b. Meine Schwester ist 5 2 und ich bin 5 2. Meine Schwester ist so groß wie ich. other. Mein Mann ist 6 0 und ich bin 5 2. Mein Mann ist größer als ich. Remember when the two items have the same amount of the quality, the adjective or adverb does not change ist form. 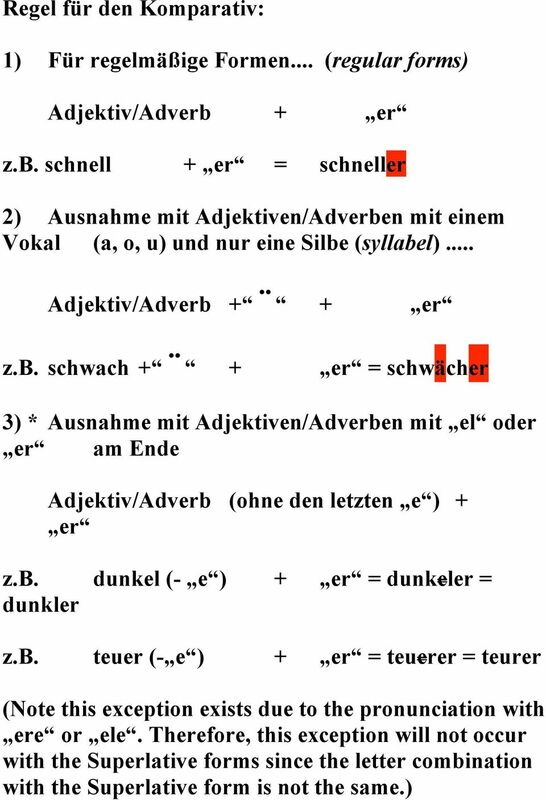 Look above at the example and you ll see that the adjective did not change (groß) Here the adjective/adverb follows the rules we have learned for the comparative (don t forget the exceptions and the irregular forms). 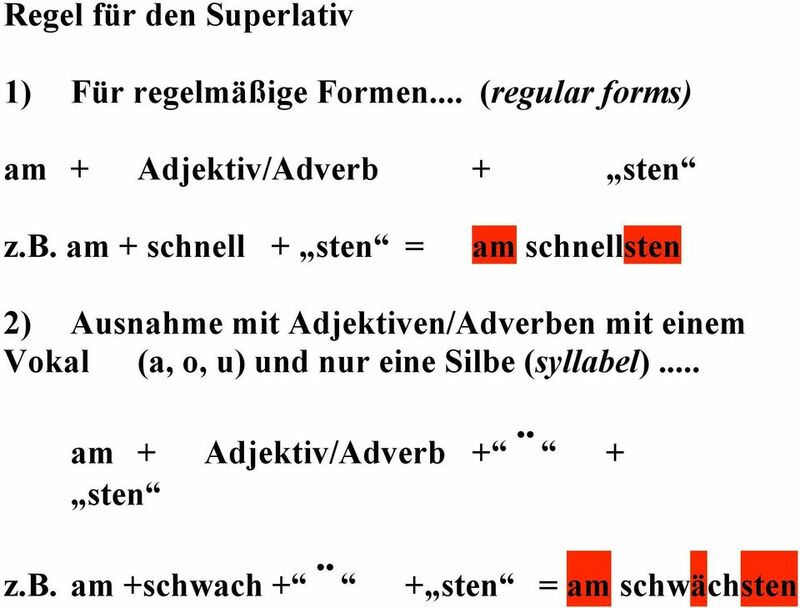 In German, there is only one way: you always add -er for comparative, and -(e)st for superlative.